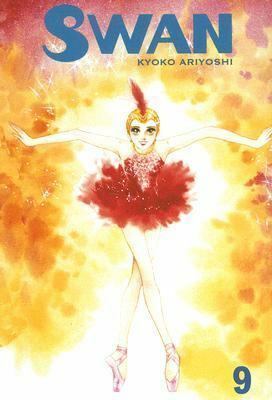 This volume is all about the Tokyo World Ballet Competition. In that way, it's a little dull, because it's just dance after dance after dance. On the other hand, we get to visit a lot of characters we met in previous volumes and meet a few new ones. Hijiri does pretty well in the competition. She misses one move, but still gets a high score because she did such a good job of covering for it. Everyone is impressed by her strength of character. It's another instance where Hijiri's inner determination makes up for her lack of technique - although we're seeing this less and less because her technique has improved so much. We also meet Leonhardt von Christ (he was briefly in the previous volume, but is more prominent here). He shows up as a student at Hijiri's school mocking ballet as boring. Then lo and behold he's a ballet dancer in the Competition. He does a solo of Spartacus. You can see his confidence/arrogance in his performance. He has a style that really sets him apart from the other men. You can already tell that he will play a large role in future volumes. This sounds like one of those filler installments, if you know what I mean. The author develops things slower and simply introduces new elements to surprise you along the way. However, it sounds like this ballet competition was full of surprises! The Ballet competition aspect intrigues me! It could easily be turned into anime. I'm so grateful to see another powerful evaluation of this guide, as well as another enthusiastic fan of Joanna Philbin's composing. Aesthetic remedies to improve the actual eye as well as eyelids are specifically chanel replica amongst older age ranges. Nobody uncertainties which totes underneath the eye, droopy eyelids as well as fun outlines aren't appealing however they may be handled along with aesthetic attention methods as well as create a individual a lot more appealing. These days, increasing numbers of people think about hublot replica surgical treatment than in the past so when these people reach particular grow older, it is their own eyelids these people consider. Eyelid remedy could make a person appear more youthful and much more in existence. The right phrase with regard to eyelid surgical treatment is actually Blepharoplasty which is the actual re-shaping from the hublot replica. The bi-product of getting your own eye as well as eyelids dealt with is actually that you'll not just appear more youthful as well as seem to be active. Ptosis may be the proper phrase for any droopy eyelid and today this is often remedied purchase tightening up the actual muscle mass helping the actual eyelid. A process that helps with the actual disappearance from the totes as well as facial lines beneath the actual eye had been really made to get rid of loose eye brows purchase a omega replica that draws your skin restricted known as the brow raise. For many, eyelid surgical treatment can offer enhanced eyesight as well as inside a research associated with 51-64 12 months olds it had been the amount cartier replica process to become regarded as.